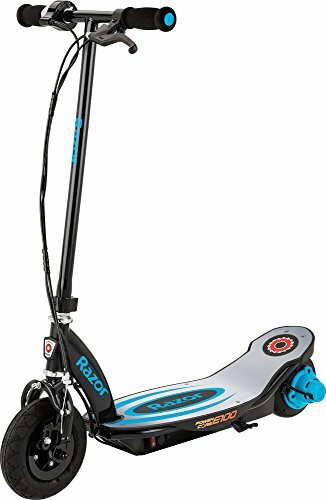 Are you struggling to find the best Razor electric scooters for kids? If so, you will have seen that there are quite a few different options available and it can quickly become overwhelming. That’s why we’ve put together this awesome review on the best electric scooters by Razor. All you need to do is have a quick read below to learn all about them. A buying guide section is also available at the end to provide you with additional information that makes the buying process a lot easier. Razor’s E100 Electric Scooter features a chain-drive motor that operates incredibly quietly while also providing them with plenty of clean electric power. Kids can use this one to travel at speeds of up to 10 mph. Therefore, you can be sure that they’ll have a blast outdoors. We liked how it comes with a pneumatic tire at the front which is 8″ in size. This works effectively to provide children with a smooth ride across different surfaces. Kids are also able to easily bring the scooter to a stop by using the rear brake which is can be activated by using the hand brake. A kickstand is available that has a spring-loaded feature which is easy for kids to use. The scooter takes 12 hours to fully charge which allows kids to play with it for up to 40 continuous minutes. 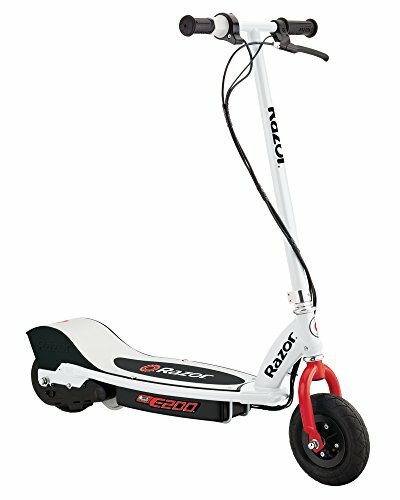 This is a fun scooter by Razor that lets kids travel at high speeds of 10 mph while also being safe due to the braking system and high-quality front tire. 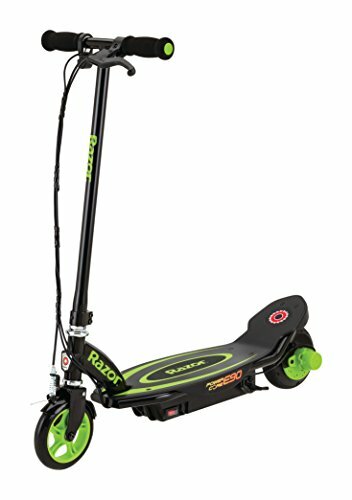 The E125 scooter by Razor has been fitted with a 24V battery which can be easily recharged to provide kids with a total of 40 minutes of continuous play. This is plenty of playtime that encourages children to be outdoors more. They have an absolute blast being able to travel at a top speed of 10 mph. We liked how the twist grip throttle feature is easy for kids to use – not to mention it’s a lot of fun and helps them to keep control on the speed. In addition to this, there’s a high-quality front brake system available. This can be easily operated by hand to allow kids to come to a safe stop at any time. A kickstand can be pulled out of the scooter which lets kids keep it upright when they’ve finished riding. This is an excellent electric scooter that lets kids have fun outdoors for up to 40 minutes at a time to travel at speed of up to 10 mph. We were impressed with how kids are able to play with this electric scooter for up to 80 minutes at a time before it needs recharging. This is a result of the new power core technology feature that has been implemented. It takes half the time to charge and provides kids with double the amount of playing time compared to other models. Furthermore, there are no alignment or chain issues to deal with, which makes it effortless to maintain. It can also fully support the weight of children who are up to 120 lbs. With a top speed of 10 mph, kids are able to have a ton of fun using this scooter to play outdoors for over an hour. There’s a push-button throttle available which is very exciting to use. Moreover, there’s a fender brake system which can be easily operated by hand to keep your child safe. We liked how this scooter allows kids to ride around for 80 minutes, while taking just 6 hours to fully charge! Razor’s Pocket Mod has an awesome vintage design which makes it a lot of fun for kids to play with. It is powered by a chain-driven electric motor which enables kids to travel at an impressive top speed of 15 mph which makes it one of the fastest electric scooters in this review. They’re able to have total control over how fast they want to ride, which makes it more exciting and safe for kids. We liked how they’ve implemented pneumatic tires that are 12″ in size as they provide kids with a smooth ride. In addition to this, there’s a rear suspension system that works effectively to keep the scooter stable over rougher surfaces. The battery that has been fitted is able to go for a maximum of 10 miles before it needs recharging, which is plenty for children to play with outdoors. We liked how kids are provided with variable speeds that let them travel at up to 15 mph for up to 10 miles. This amount of speed and distance available will keep your child busy for a while! 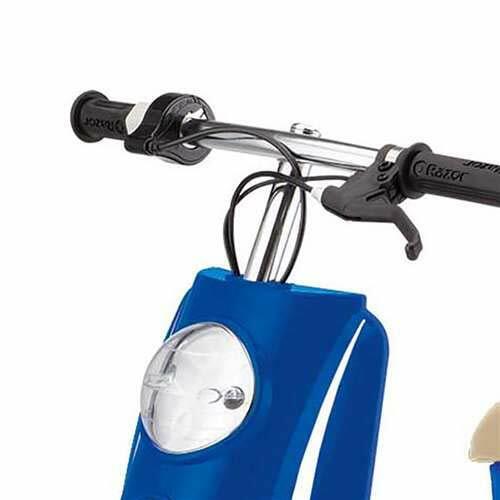 The EcoSmart Metro Electric Scooter is powered by a 36V battery that allows it to travel at high speeds which kids have been having an absolute blast with. There’s a throttle available that provides kids with complete control over how fast they want to ride. We were also impressed with how they’ve used high-quality padding materials for the seats. You can expect your child to play with this one outdoors for a long time while being comfortable. The rear disc braking system that has been fitted is incredibly reliable and works effectively to keep your kids safe. We liked how they have also implemented pneumatic tires that are 16″ in size as they ensure the scooter has a lot of stability. Kids love being able to sit on this electric scooter and ride it around at fun speeds while being comfortable. The rear disc braking system is also fantastic for keeping your child safe. Razor’s E300 Electric Scooter comes with a chain-driven motor and a high torque features. In addition to this, it’s able to travel at a top speed of 15 mph, which is plenty for kids to have a blast with. After being fully charged, it can last your child for up to 40 continuous minutes. This provides kids with plenty of time to play outdoors and have a blast. We liked how the frame and deck have been created with a super-sized frame. It works effectively to provide children with more stability while riding. Moreover, there’s a twist-grip acceleration feature included. This ensures that children have complete control over the speeds that they want to travel at. The 15 mph top speed and twist-grip acceleration are a lot of fun for kids to use. This is especially the case since they’re able to use it for up to 40 minutes of continuous play. This E200 model comes with an incredibly quiet chain-driven motor and a high-torque feature which is a blast for kids to experience. It’s powered by a 24V battery which lets kids travel at up to 12 mph. We liked how they’ve implemented a twist-grip throttle. This is because it provides children with complete control over how fast they want to travel and it’s easy to use. They’ve also implemented a rear brake system which can be operated by hand. This is effective at bringing the scooter to a stop every time. We were also impressed with how they have used 8″ pneumatic tires as they ensure that the scooter is able to go across surfaces smoothly. A spring-loaded kickstand is also available which is easy for kids to use. 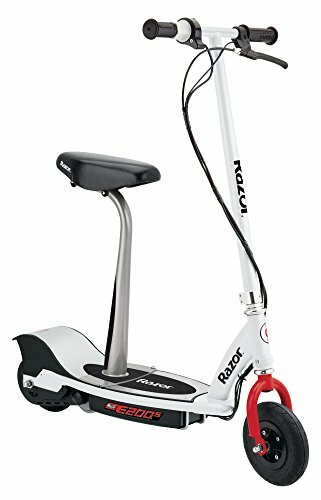 This is an excellent electric scooter that allows kids to ride at up to 12 mph while having complete control due to the twist-grip throttle. The RX200 Electric Off-Road Scooter is able to travel at a top speed of up to 12 mph. This provides children with plenty of power to ride around on off-road conditions with to have a blast. We liked how they’ve fitted special off-road tires to ensure that your child is able to experience a fun and smooth ride. In addition to this, a fantastic gear ratio is available too which allows for exciting high-torque trail riding. The disc brakes that have been fitted are super easy and reliable to use. Therefore, you can feel confident in knowing that your child can bring themselves to a safe stop while on rougher terrain. Kids have a ton of fun being able to use this scooter to explore more challenging terrain by going off-road. The off-road tires,high-torque trail riding, and reliable brakes make this the perfect choice for going off-road. 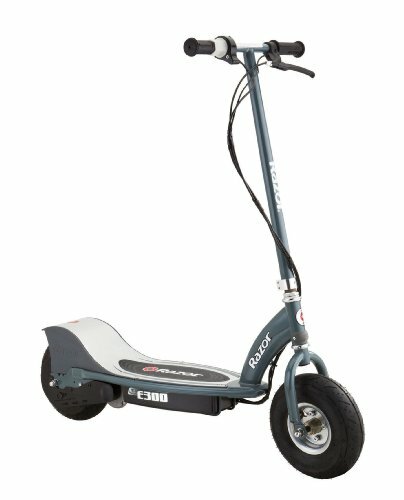 The E200S Electric Scooter by Razor comes with a super quiet chain-driven motor and a high-torque feature. It’s powered by a 24V battery which enables it to travel at a maximum speed of 12 mph, which is plenty for kids to have fun with. We liked how they’ve included a twist-grip throttle as it makes controlling the speed a lot easier. Furthermore, they have incorporated a rear brake system that can be operated by hand. This braking system is reliable and easy for children to use. In addition to this, there are 8″ pneumatic tires that have been fitted which allow kids to ride with smoothness. The riding seat that’s available is great for keeping your child comfortable on longer rides, but it can also be removed. The larger 8″ pneumatic tires provide kids with a smooth ride and the twist-grip throttle makes it super easy for kids to control the speed. The Power Core E100 Electric Scooter has been fitted with some fantastic technology that allows it to travel for longer while also being more powerful than the regular E100. After being fully charged, kids can use it to ride at a top speed of 11 mph. This is plenty to allow them to have fun while remaining safe. Furthermore, they can ride the scooter continuously for a total of 60 minutes. This is a great feature that encourages them to play outdoors for longer. We also liked how they have implemented a front caliper brake that can be operated by hand. This is incredibly easy for kids to use and works reliably to bring them to a safe stop. There’s a kickstand that can be effortlessly pulled out and put back inside the scooter to keep it upright when it’s not in use. This scooter provides kids with an hour of continuous play that lets them ride around at up to 11 mph. Therefore, you can be sure that your child will want to be playing outdoors more and having a blast. 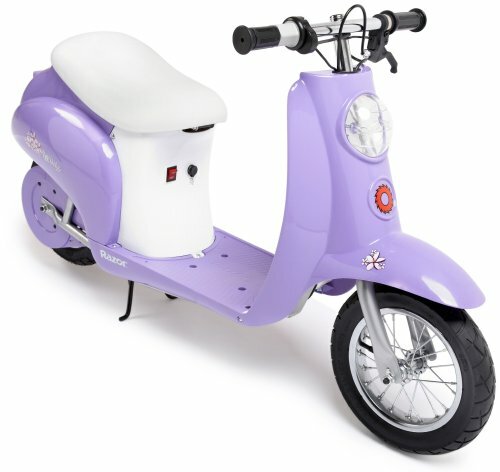 The Pocket Mod Euro Electric Scooter comes with a fantastic pink design which girls have been loving. We also liked how it comes with a V17 helmet which is great for keeping your little on safe while they ride around. The helmet is great for head sizes that are between 22 and 23.5″. Moreover, we were impressed with how kids can use this scooter to travel at a maximum speed of 15 mph. This is plenty of speed for children to have an absolute blast with. Furthermore, they’re able to have control over the speed that they want to travel at. Not to mention, this scooter is able to go for 10 miles before it needs to be recharged, which provides kids with a lot of playtime. People have nothing bad to say about this one! This is an excellent choice to let your little girl have fun while being safe. 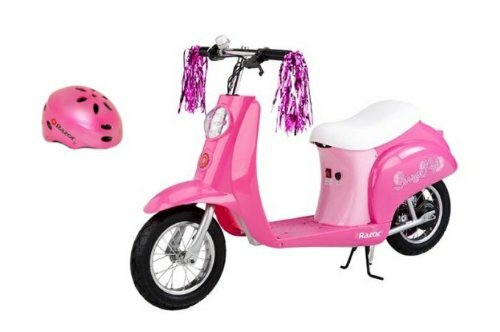 It comes with a fantastic pink design and helmet, while letting kids ride at up to 15 mph. 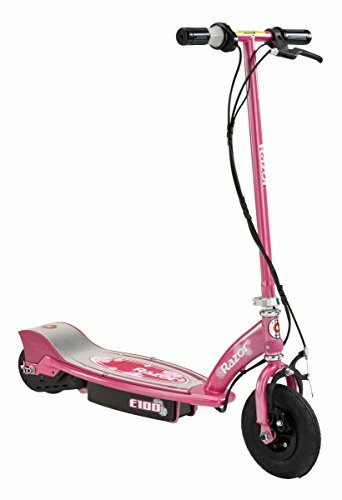 This E175 Electric Powered Kids Scooter is also available in an excellent pink color which girls have been having a lot of fun with. We liked how they’ve made the deck and frame to be the perfect size for children which ensures that they can ride it comfortably. The motor that has been fitted in this scooter run quietly and allows kids to travel at a top speed of 10 mph. Therefore, you can be sure that your child will have an absolute blast being able go at faster speeds. In addition to this, your child is provided with a total of 40 minutes of continuous play which is plenty. This encourages them to play outdoors more often. Not to mention, the frame has been made using steel materials which are super durable. With 40 minutes of continuous play available, your child is able to have a blast outdoors for a long time. We also liked how they’ve used steel materials as it keeps the scooter durable for years to come. Razor’s E325 Electric Scooter has been designed with a wider deck that provides kids with a lot of stability while riding. The quiet chain-driven motor provides kids with a top speed of 15 mph. This ensures that they’re able to travel at fast speeds and have fun. We also liked how they’ve implemented a twist-grip throttle because it provides children with total control over the speed that they want to travel at. Moreover, there are 10″ pneumatic tires available. These are effective at providing children with a smooth ride across rougher surfaces. It takes 12 hours to fully charge which provides kids with a total of 40 minutes of play. This is a lot of time for kids to play with the scooter and be outdoors more. 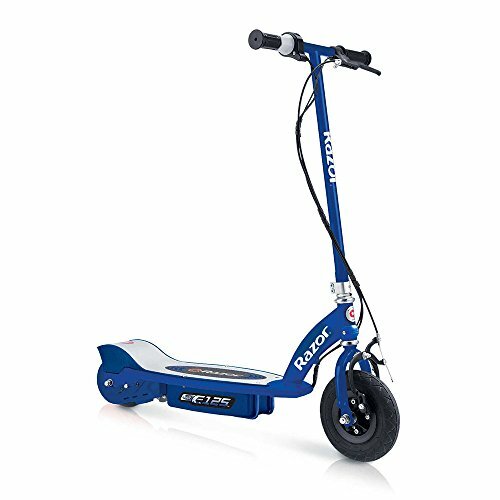 This is one of the best scooters for teenagers as it lets them travel at impressive speeds of up to 15 mph. This Pocket Mod Miniature by Razor has been created with an excellent vintage design which looks fantastic and makes it more exciting for kids to ride. They’re also able to travel at a top speed of 15 mph. This is plenty to enable kids to have a lot of fun. We liked how they’ve included a variable speed acceleration feature as it provides children with total control over the speed that they want to travel at. Furthermore, we were impressed with how it can last for up to 10 miles after being fully charged. This is a lot of mileage which means children can play with it for a long time which encourages them to be outdoors. The vintage design of this one makes it more fun for kids to play with, especially since they’re able to travel at a top speed of 15 mph. Now that you know more about what some of the best Razor electric scooters have to offer, you can begin narrowing down your search to finding the one that you think your child would enjoy the most. If you still aren’t feeling completely confident on which one to pick, you’ll want to take a look at this buying guide section. We’ve included some fantastic information that will help you feel great about finding the best electric scooter for your child. After reading through the review above, you will have seen that there are a number of different types of scooters available. We’ve created this section to help you distinguish between the various types with ease. There are numerous scooters available that come with seats. These are great for kids who want to playing outdoors for a long time. They’re also good for younger kids who may still be developing their ability to balance. These seats are padded which ensures that your child remains comfortable while playing. Some of them can also be easily removed if your child wanted to stand up and ride their scooter. 3 wheel electric scooters can be a great way for younger kids to learn how to use a scooter. This is because it provides them with more balance which gives them the chance to get to grips with how to balance on it. These kinds of electric scooters also ensure that children have a lot of stability. Therefore, they can be great for riding across rougher surfaces while giving kids a smooth riding experience. Off-road electric scooters are super fun for kids who want to be more free to adventure. They’re able to explore off-road paths and surfaces which encourages them to play outdoors more often. These electric scooters are made with tires that are larger to ensure that children are able to have a smooth riding experience on rougher surfaces. The braking systems that have been fitted to these types are also incredibly strong and reliable. 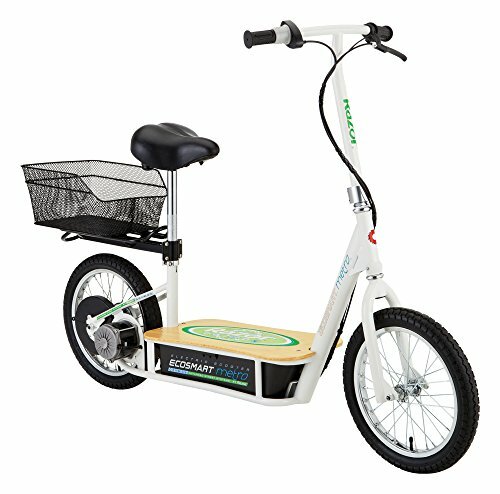 Folding scooters can be an fantastic choice if you’re looking for something that you can store away easily. By being able to fold these scooters, you can find more suitable storage while also being able to take it with you while traveling. Kick scooters are a classic toy for kids to use while playing outdoors. They require children to be more active as they can only move it forwards by using their feet. Therefore, it’s an excellent way for children to get more exercise while also having a blast. Self-balancing scooters are super fun and unique for kids. They allow you to stand on top of it and control them by using your body weight. Moreover, these scooters tend to come with LED lights which make them super exciting to ride. While reading through this review of the best Razor electric scooters, you may have been wondering about the other top brands that are available. If you were interested in what some of the other top brands are, this is the section for you. When doing a search for the best online scooters, one of the most popular brands that you’ll find is Mobius. These scooters often come with a self-balancing feature which enables younger kids to learn how to ride and have fun while being safe. Glion is a great brand that makes electric scooters that have a folding feature. This makes them super easy to take around with you and store away after your kids have finished playing with it. Gotrax is another awesome brand that are well-known for manufacturing electric scooters for children. They come with high-quality tires and incredibly fast charging times. 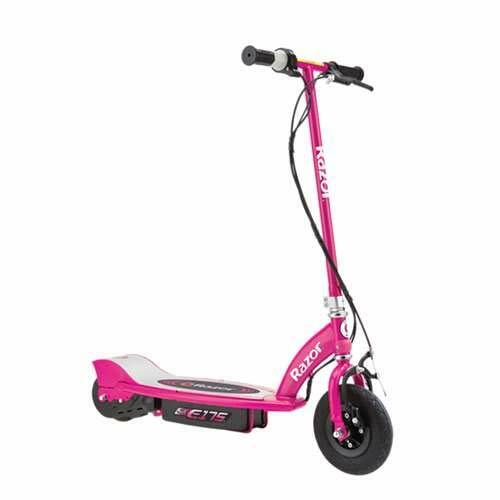 We’ve included a number of awesome electric scooters that girls have been loving, such as the Pocket Mod Euro Electric Scooter and the E175 model in pink. 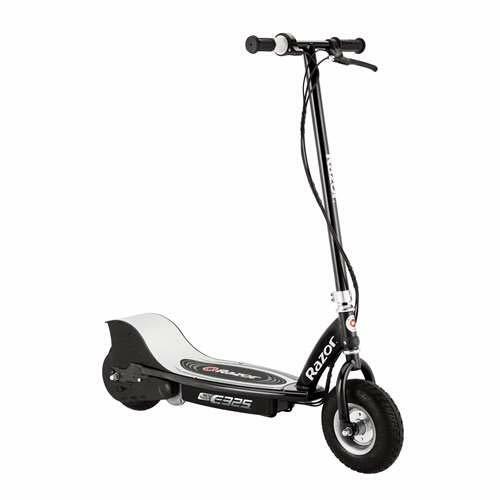 However, the one that we recommend the most for girls is the E100 Electric Scooter. This is because of the awesome pink design and how it can travel at up to 10 mph and provide kids with a smooth ride. When it comes to picking an electric scooter for boys, there are numerous choices in this review that would be fantastic. Most notably, boys have been loving the E90 electric scooter because of the awesome black and green color that it’s available in. They also have up to 80 minutes of playing time which is plenty to ensure boys can have a blast outdoors for a long time. There are a couple of other factors that you’ll want to take into consideration before you go ahead and make your final decision. To learn a little more about what some of these other important considerations are, take a look below. The safety of your child is paramount, especially when it comes to electric ride on toys. 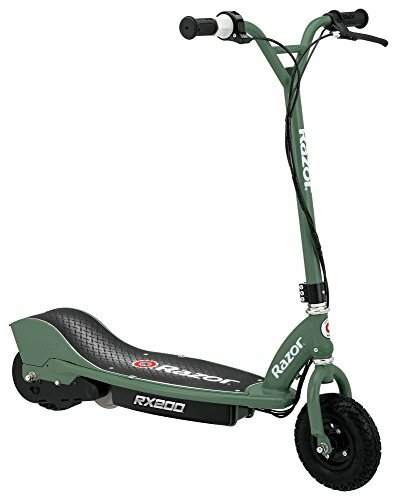 There are some key features to think about when looking at these kinds of scooters for your child. Some of the main ones being the top speed and age recommendation. We’ve provided you with the age that we recommend each scooter for to ensure that you’re properly informed about what kinds of speeds are suitable for different ages. The way that kids control the speed is another feature to lookout for. Some of these scooters have a feature that involve a push-button which doesn’t provide kids with the ability to change the speed. If you want to provide your child with complete control, an electric scooter that comes with a twist-grip throttle would be best. This lets children have total control over the speed they want to travel at. The Pocket Mod Euro Electric Scooter is one of the only options in this review that comes with a helmet. Therefore, you’ll need to find suitable helmets for your child to keep them safe during any accidents. So, that wraps up our review on the top children’s electric scooters that are available. Hopefully, we’ve provided you with everything you need to know about how to go about picking the best motorized scooters for your kids. Be sure to read through the main features, pros, cons, age recommendations, and what makes each scooter stand out. That’s what will give you the best idea of whether that scooter is the right choice for your child or not. Our buying guide section also included some great information that helps you feel even more confident about your final pick!